[1.] rAas al hussain a.s. & graves of fatimi imams a.s. Location: ​Ras ul Hussein is inside the mosque named "Imam Hussein mosque". (1.) "Imam Hussein mosque" should be quoted to taxi driver or anyone. It is very famous landmark and everybody knows it. This mosque is adjoined with 'Khan el-Khalili' market. Uber / Careem mobile App will be very handy to commute between places. The local taxis can be at times unreasonably overcharging to tourist and most of them speak Arabic only. (2.) Bohra's (Sy. Mufaddal sahib affiliated) markaz (guest house) is at 15 minutes walking distance, it is the best place to stay, like a five star, rush is there during winter and holidays, so make sure the booking is confirmed much in advance, the markaz van accompanied by a guide takes for tour to all important religious places and ziyarat. Visit markaz website for the details. We heard Sy. Tahir Fakhruddin sahib affiliated guest house to be somewhere near, unfortunately we don't know the details. Other Bohras / reformist may reside in hotels in or near to Khan el-Khalili. Don't go for the cheap hotels, they may be very bad in terms of hygiene and facilities. Cafe near Imam Hussein mosque charges literally ten times more to tourist, try to avoid them. (3.) The Imam Hussein mosque opens at fajr prayers and close in night at approx. 9PM. There are two separate entrance for ladies and gents. 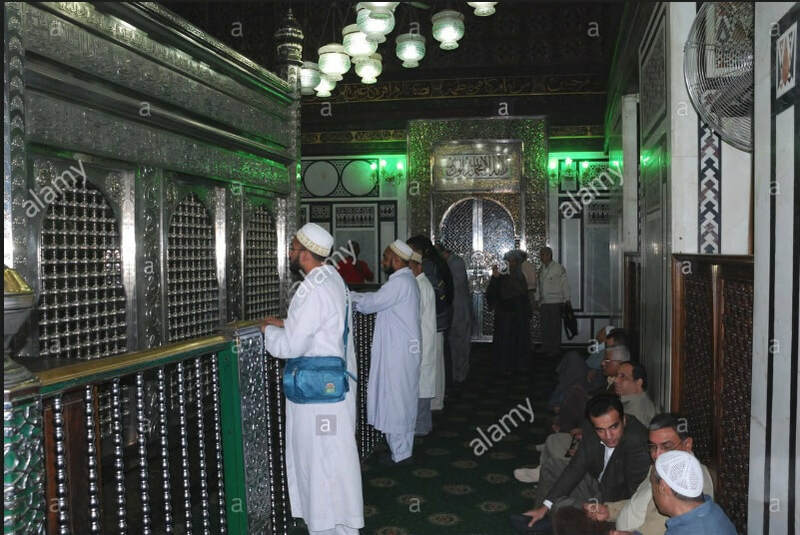 The doors to room hosting Ras-ul-Hussain remain close during the time of namaz. Photography and video-shooting is allowed. You can take your shoes inside mosque in a plastic bag or can deposit at the mosque entrance (cost 3-5 EGP) , you cannot wear your shoes and go in. (4.) On entering the mosque, immediately on first right side there is management office, inside that, there is one locked room and inside that there is one another locked room - that is the place where Imam Hussain a.s. head was kept in beginning, a tunnel was dug from that place till the place where the head is presently buried, head moved from that place through that tunnel to the place where it is ultimately buried now. Fragrance of musk can be felt only from that particular point of wall (tunnel entrance), and not from anywhere near. This tunnel entrance which is now closed by red-bricks. This place can be privately accessed by requesting to the mosque staff, the head clergy and few others may be showered with some "special" request. ​(5.) Dua to be recited near Ras-ul-Hussain a.s. [2.] Syyeda Zainab a.s. bint Mola Ali ibn Abi Talib a.s. [5.] Syyedi Malik ul Ashtar a.q. The chief dai of the Fatimids al-Muayyad fi’l-Din al-Shiraz, passes away in Cairo on 10 Shawwal 470/26 April 1078. He is buried in the celebrated Dar al-Ilm where he was a teacher. [1.] ​Nabi Luqman Hakeem a.s.